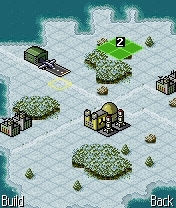 Islands: Missile Invasion offers a highly accessible strategy type game-play in which your mission is to build-up your own Islands, and destroy that of your opponent. The single-player mode offers a full campaign mode, and the multi-player game mode can be played using either one handset (hand-over), or using Bluetooth for an enhanced experience. I did this game for Luna Games. I did all programming work and most notably implemented the Bluetooth networking system.